These are few words that you’d typically associate or come across reading inspirational stuff. Be it Habits-of-Successful-kind-of book or some forward about leaders or biography of a great person. Below is an actual lunch-time conversation between two 3D-guys. Both laugh heartily and then cite another interesting example from popular English movie “Ocean’s Twelve” … Master thief appreciating one prodigy in presence of ‘other student’ who is offended by this statement. This leads to the chain of events and the complete storyline, the ‘other student’ challenging and trying to prove his supremacy over the ‘best thief’. Appreciation is an integral part of ‘Success’ life-cycle. In fact getting positive feedback from people who matter always triggers a desire from within to do better in future. It’s like wooing your girlfriend (or boyfriend (???) are they wooed at all for that matter:)). You gift her flowers, chocolates, diamonds and score brownies and she in turn reciprocates with her the feelings and gifts. It’s very special in a way. Similarly, we exchange gifts with relatives and friends. Let’s say, the tradition of gift money at occasions like weddings. So many people gift Rs. 51 or 101 or 121 or 501 (similar amounts… numerology stuff :)). Do we feel anything special about such ‘gift-money’? 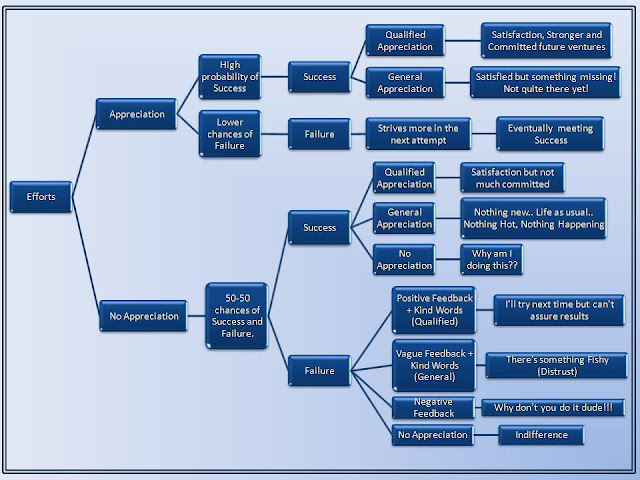 Well… from above chart it’s very obvious the importance of some kind of feedback in any task that we take up, not just professionally but even in our personal endeavors or interests and hobbies. And if this feedback comes from people whose voice matters, it’s as if sone pe suhaga. There couldn’t be a better thing. Self motivated and driven people are very few. But there are lots of people who are passionate or get involved very quickly with something of their interest. It’s just a matter of few encouraging words that releases their potentials. Success does come with its share of by-products. Few are good, few bad. Like for instance, with success come ignorance and arrogance. However if channelized properly though good mentors (remember qualified appreciation? Add to that bit of grooming) this can turn into prudence and humility. With success also comes expertise and confidence. To ensure these are not wasted, engaging and challenging newer paths should be explored. Satisfaction is good and usually leads to new ventures which should be encouraged. Very interesting post Abu. I don't think I've ever seen such an important and complex subject evaluated this way. I think that kind words have more of an effect than you give them credit for. :) Since you know my profession, you can probably see why I believe this. But, I would also argue that it depends where along the personal>commercial spectrum this chart lies. The closer one gets to purely commercial interests, the more intense the whole subject becomes. Even in the most explosive business conditions I have used a few kind words to keep things from getting even harder to resolve. It's also nice to see "3D-guys" being used as an ordinary term. Most of the time, the question is "What is 3D?". Thanks for writing something worth thinking about!